I had a nice surprise this weekend when I found out my painting Symbiotic received “Best of Show” in the Surreal Salon IV. 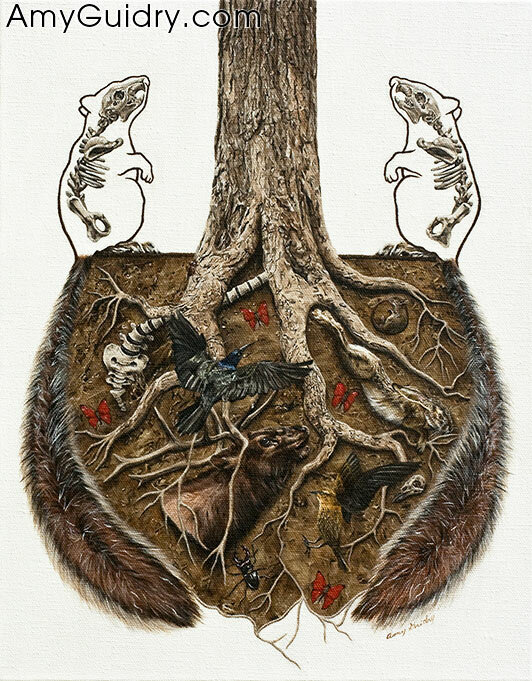 As a result, Symbiotic will be featured in ads in future issues of both Juxtapoz and Hi-Fructose magazine as the winner of the Surreal Salon. I was excited just to have been accepted into the exhibit since these types of competitions receive hundreds of entries from all over the country. The fact that two of the paintings I entered were selected was big for me, so winning the Best of Show award is beyond words. It means a lot, especially in such a subjective field, and if I were a writer perhaps I could better explain this, but those of you who are artists know what I mean. If you have not seen the show, there is still time as it will be up through the 26th (Thursday!) at the Baton Rouge Gallery – Center for Contemporary Art in Baton Rouge, LA. Both my paintings The Pack and Symbiotic are featured and can be found on my website at www.amyguidry.com/symbiotic.html as well as in the online catalog of the entire show at http://issuu.com/batonrougegallery/docs/surrealsalon4. I received a great little review by Brad Martin of Secret Still the other day. My painting Untitled (Heads) is featured (as seen in the screen grab on the left). I was flattered that Josh Keyes came to mind when he viewed my work, as I am a fan of his as well. You can read his flattering- and humorous- review at http://www.secretstill.com/blog/2012/01/11/amy-guidry/. Website– This seems to be the most obvious but there are many artists out there that don’t have one. This should be your #1 priority over all other ideas listed here. Cost can be a big factor, so if you can’t afford to hire a designer, talk to talented students or freelancers that do this as a side career. You can probably get a better deal– just be sure to look at their portfolio beforehand. If this is not an option, you can also use WordPress to create a site in which you feature galleries of pictures. Blog– Again, you can use WordPress for this, but there are many other options out there. Blogging is important to help build your name, increase your SEO ranking, and gives you an opportunity to connect with fans. Facebook– I see many artists using Facebook, which is great, but far less have an actual Fan Page. First, Facebook expects that you will promote your business and conduct sales through your Fan Page, not your personal profile. Sure, Fan Page posts tend to get filtered out of the news feed, but in all fairness, Facebook is not taking a cut from your sales made via your Fan Page. Drive traffic to your Fan Page via your website, blog, etc. and include links to your Fan Page on other websites. Twitter– Personally, I find Twitter to be overwhelming, but no matter your social media preference, it is important to be present on any and all. I have found that fans/collectors/potential collectors all have their own personal preference for following you, therefore you need to reach them through all of these sites. Google+ – Some people still don’t know what Google+ is. To me it is just another version of Facebook, except without all the “flash.” No ads, no news feeds, no news feeds in your news feeds (haha), and it makes it much easier from the get-go to control your privacy settings and even per post. As far as I know, you still have to be “invited” to join so if you haven’t already, ask a friend to send you an invitation. Blogrolls– Besides your own blog, increase your exposure by getting your site included in the blogrolls of blogs that you like. These are lists of sites that are recommended and tend to share similar interests with the blog listing them. Ask to trade links with your artist friends- their link listed on your blog and yours on theirs. You can also approach bloggers that you like to trade links. Comment– One of the best ways to get noticed is to leave a comment. So many sites feature like buttons or share buttons, which are great, but don’t forget to leave a comment. If you have something valuable to add, do so! You don’t have to agree with the writer, either, just be civil. When posting, depending on the site, you may have the option of adding a photo of yourself- a Gravatar– or if you can sign in via Facebook or Twitter, use one as long as there is a photo. People are visual creatures. You’ll also have the option of including your website or social media link, too. These are my best recommendations, but there are new sites being created all the time. If you have any ideas you’d like to recommend, please add them to the comments section! I’ve just finished my first painting of the New Year! 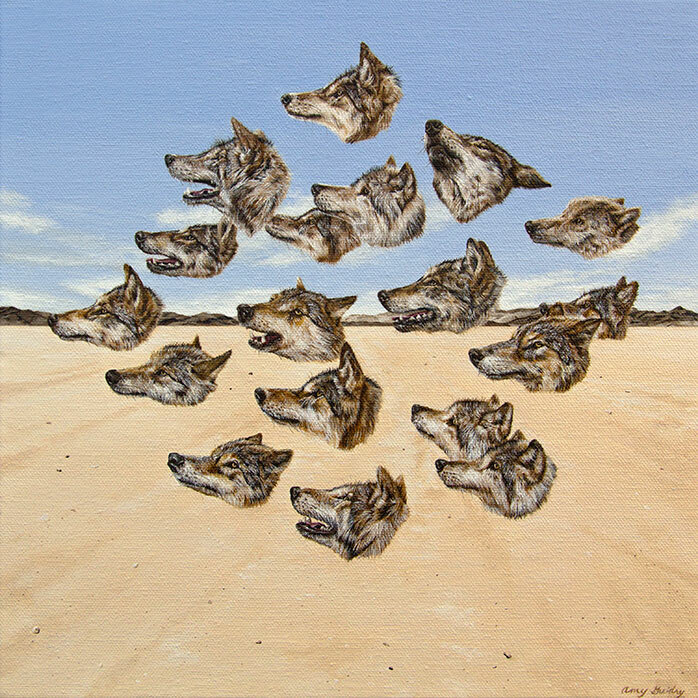 This is another new addition to the In Our Veins series titled Wolfpack. It is an acrylic on canvas, 12″ by 12″ square. I went through, on average, one paintbrush per wolf head on this one. I build up the colors in each layer and then start adding layers of hairs, working my way up to the lighter hairs, therefore my paintbrush takes a beating. Well worth it, though, since I am pleased with the outcome. This is a “sister piece” to my painting The Pack (which is one of the paintings I will have featured in the Surreal Salon at the Baton Rouge Gallery- Center for Contemporary Art!). You can check out both paintings on my website and for a better view of Wolfpack, visit www.amyguidry.com/wolfpack.html. 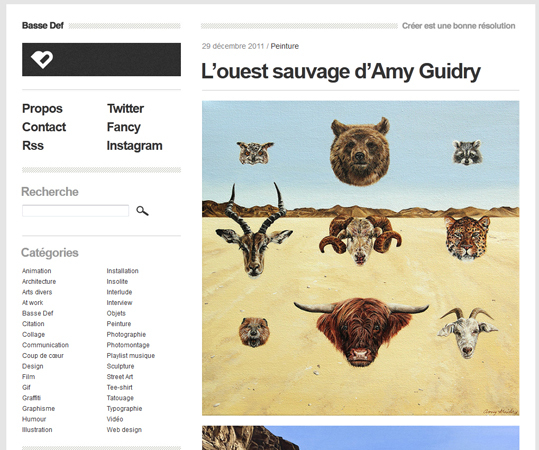 I’m happy to announce that my work is currently featured on the Parisian art site Basse Def. It is a fantastic compilation of various art forms and I am honored to be featured among such great work. My paintings Heads II and The Wild West are featured. 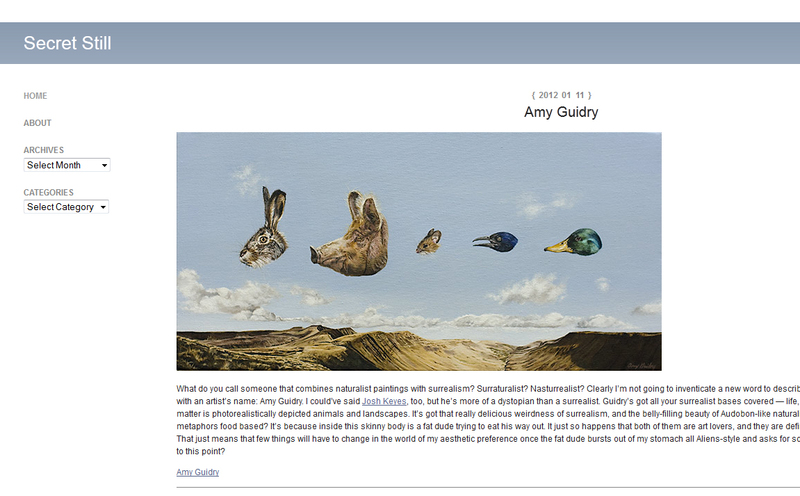 I’ve included a screen grab here but you can visit the site at http://www.bassedef.com/blog/amy-guidry/. Happy 2012! This is my first post for the New Year…funny it’s regarding my last sale of the past year. 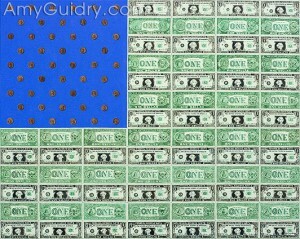 My painting United States of Consumerism has just been added to a fantastic local collection of art. 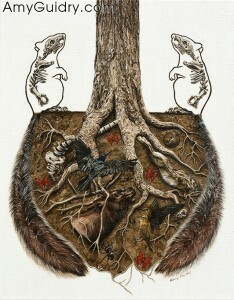 This painting was done in 2007 as part of a series of social commentary works, Beneath the Surface. It is an acrylic on canvas, 24″ high by 30″ wide. 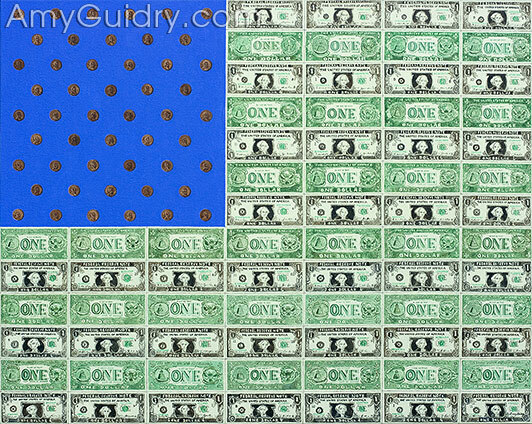 A couple of my artist friends thought I was nuts to take on such a piece since I painted each and every dollar bill and penny on there. No stamps, no gimmicks. By the time I finished, all my tiny little paintbrushes had splayed bristles and were completely unusable. I also had to put in some long hours to finish it in time for an exhibition. Regardless, I was happy with the outcome. The photos just don’t do it justice, but you can view a larger image of it here.